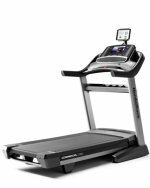 The Lifespan TR800 folding treadmill has many of the same cool features as pricier Lifespan models including the hydraulic folding system that gently lowers the deck to the ground, plus quality components. The blue backlit LCD display shows time, calories, distance, steps and more. Along with 17 preset programs, it has two My Zone heart rate control programs, and two Custom workouts. Wt / Dimensions: 169 lbs / 66" x 31" x 54"
UPDATE: The Lifespan TR800 has been discontinued. 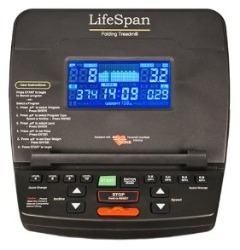 Check out the Best Buy Lifespan TR1200i for a comparable model. 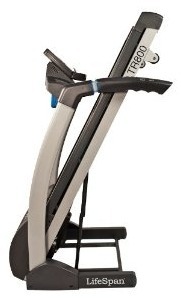 The Lifespan TR800 folding treadmill has a number of key features to note including a 1.75 horsepower continuous duty DC drive motor, an incline motor with a 650-pound max lift capacity, 2" rollers on the front and rear, a 3/4" Phenolic deck, and eight variable density elastomers for shock absorbers in the suspension system. The programs are goal oriented and include Sports Training, Healthy Living and Weight Management. In addition, each program includes 20 workout segments that can be used at three different intensity levels. The heart rate control programs monitor your heart rate to keep you working at a constant level. The treadmill is rated by the manufacturer to be for “light use” only. They define light use as 30 to 45 minutes, 4 times a week, by users under 210 pounds. 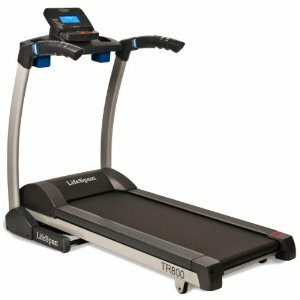 The Lifespan TR800 is a basic folding treadmill priced at $899. It gets fantastic reviews, and judged by itself it is a good buy. However, when compared to the rest of the Lifespan line, it isn’t the best value. For just $100 more at $999 you can often find the TR1200i on sale. Since these are comfortable treadmills, you’ll want to increase the amount of exercise time you spend on them, so go with the higher models. Pay just a little more now and get a lot more treadmill for your money.